Getting kids more interesting in food, and in cooking, in one of my personal goals. As a child, for some unknown reason, I had an affinity for cooking, and developing those skills has given me a lot over the years. I want my daughter to have the same. I want other kids to have the same. One of my strategies to ensure that, is to make food fun…and I show you one way to do that in this recipe video for “Jack-o-Lantern” soup. The soup itself is a very simple to make pumpkin soup. 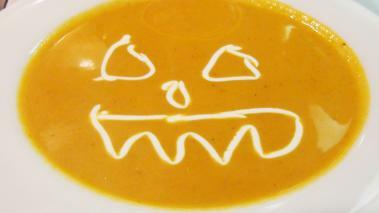 But at the end, I’ll show you how to decorate the soup with a jack-o-lantern face. This is the perfect soup for Halloween, and I make it every year. Each kid I’ve served the soup too has loved it, and of course, I love seeing them happy. It’s really easy to do, and you need no special equipment at all. Hope you enjoy it as much as I do!! Head over to my Pumpkin Soup recipe for the keys to making the soup itself taste great. The key to making the Jack-o-Lantern design is to make the whole in the plastic bag very small. That gives you more control, and a better looking design. If not sweet, or creamy enough for your tastes, add more of both/either. Re-season with salt and pepper if needed, and blend a final time. I’m sure better artists than I can come up with much fancier, creative designs…you can definitely make it your own, and I hope you enjoy the soup as much as I do!! For this, and many pureed soups, I’d recommend a champagne or sparkling wine. It both cuts through the rich soup, and the bubbles provide a nice contrast is “texture”. If you really want a still wine, I think a full bodied white wine like Chardonnay or Viognier would work well.